Chamisa's recent campaign rally held in Bulawayo at White City Stadium was ignominious. In his speech (orated largely in Shona), he promised the coronation of Bulelani Lobengula as early as September 2018. Surely a rocket scientist is not needed to cue the folk that the tendency of making vacuous promises to lure the electorate is an archaic, antediluvian technique. Chamisa is not charming anyone by averring such derisory rants. Does he perceive MTHWAKAZIANS as mere marionettes? Does he see us as swashbucklers that can be operated with strings by a puppeteer in this day, age and generation? We fully comprehend that such a political statement was smear intent to snip votes from MTHWAKAZI. It is profoundly regrettable that he conceives that his MDC will be doing us a great favor. It is not a favor at all! It could not be a noble decoy to lure the electorate. The best bait for him is crystal clear. He should acknowledge the untold suffering and marginalization that MTHWAKAZI has gone through. He should acknowledge the essentiality and imperativeness of the MTHWAKAZI RESTORATION. He should express his stance on the emancipation of MTHWAKAZI. Only a chump would do the same things over and over again and still expect different results. Only a fool would be dissipated a multiple times and still fall for the same snare. We say no more to bare rhetoric! His coronation mantra is just a nak*d palaver. 1. ZANU PF ostensibly gave a green light to the coronation of a King whose role would be ultra vires the TOTAL RESTORATION OF MTHWAKAZI, but to play a very insignificant role of presiding over cultural issues and events only. Before the red devils (Lacoste team) captured the throne of the chief devil-Mugabe, Kasukuwere had put forward a scheme of hoodwinking the MTHWAKAZIANS from the real agenda to the petrified enemy’s (ZANU-PF) stable. Their cognition content is to demote the Kingship role to that of "cultural overseer". The plan is of coronation of a slavish yes-man of ZANU-PF political cultism. That is tantamount to ridiculousness and hypocrisy which is totally offside. We want TOTAL RESTORATION OF MTHWAKAZI. Those who want to remain in Zimbabwean vitiated political world must do so without pulling everyone with them down that drain. 2. The EDiots-led Junta is now in power. Our dear kin and kith, still smarting from a promise to be let to install a King, got the shock of their lives when the Junta blocked the planned coronation path. Then the attempt to use the old promise by the then ZANU-PF Local Government Minister Kasukuwere, met serious resistance from the new Junta government. Obert Mpofu as the Junta’s Home Affairs Minister, has been used by his colleagues in the Junta administration, to tell the proponents of King Coronation to go hang. Our brethren never realized that the promise expired when the coup took place. The ‘Lucific’ Junta takes no recognition of such issues as they see them as unnecessary delinquency by grownups. Thats what that junta government is saying as can be read from Home Affairs Minister's statements on the Kingship issue and on "Chief" Nhlanhla Ndiweni. The wise should read between the lines. Then the attempts to cajole ZANU-PF to have the coronation of Bulelani Lobengula are still being pursued (if that is true) but hopes will eventually evaporate. 3. While still trying to wheedle ZANU-PF to coronate Bulelani Lobengula, behind the scenes, some of the camp leaders went behind the back of others, thinking that Chamisa is likely to win the ZANU-PF Zimbabwean elections, and persuaded him to gush out a blasphemous statement to the effect of crowning Bulelani Lobhengula. That was an infertile statement. We need no political glove from MDC. Neither do we need it from the Zimbabwean Junta of EDiots. Those who want the not so charming Chamisa to do what he gushed out must relocate to Mashonaland. We do not need them. The game of political poverty is being exposed from so many political parties that want to partake in the ZANU-PF Zimbabwean elections. This Chamisa, in an attempt to ride on Umdala Wethu’s Legacy also claimed the Nkomo family endorsed and offered him the veteran nationalists’ scepter. This has however turned out to be an absurd lie. If seriousness is a virtue, then one can sense elements of political immaturity from the young man. 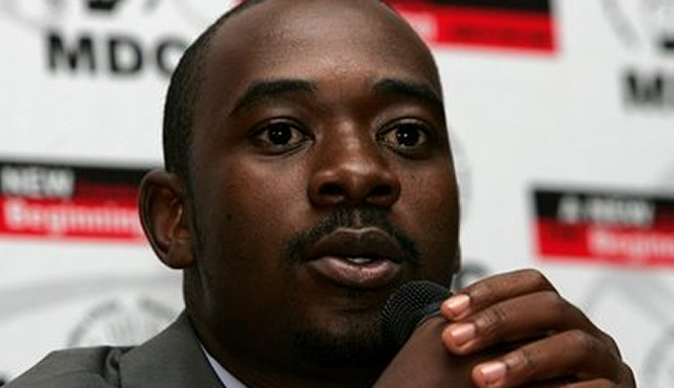 This Chamisa is a political toddler! As a people, we do not want a king whose enthroning needs the blessings of Mashonaland. We do not answer to them. We accordingly do not cherish or ideate the prospect of having a king who is accountable to them. If however, Bulelani and associates are felicitous about it, then it is fine. He will be a Zimbabwean king. We shall have our own King recognized and honored as such within the boundaries of MTHWAKAZI. Whoever will be crowned by the Shonas should prepare his future home in Mashonaland. We do not support the idea of a ceremonial Harare-flunkey king. We want a real king with jurisdiction over our territory. It is deeply saddening that the RESTORATION AGENDA is being hijacked by people whose interests are to maintain the status quo and keep our nation in perpetual penal servitude. Such is the Bulelani kingship and we thus dismiss it as a non-event. May someone explicate and remind Chamisa that he has no say, idea or whatsoever on these Kingdom issues. He is a Mnangagwa's project hence the need for him to shut up! ZANU-PF and MTHWAKAZI issues are two incongruent facets. Chamisa must not take us for a ride. He should not seek to gain political mileage on issues he cannot put up with. The folk is too young to make such utterances concerning our Kingdom issues and MTHWAKAZI affairs. Chamisa must go and play with his bullet train toys (he spoke about in Chinhoyi) in Mashonaland and leave MTHWAKAZI politics for MTHWAKAZIANS. Otherwise we will pamper him in Matabeleland. As a people of MTHWAKAZI, we want a clean RESTORATION of our nation and all that goes with sovereign nations. SRK/Mzilikazi ll, has given us and the world the model expected from a King. This is a King who will not only preside over cultural issues but beyond that. He is a King who advocates for the RESTORATION of MTHWAKAZI's sovereignty. This is a king who seeks justice for the MTHWAKAZI nation through separation from Mashonaland/Zimbabwe. Surely how can we dine and merry with carnivores who wanted to eliminate every Ndebele soul from the face of the earth? Mzilikazi ll, is a King who wants to conclude the imperfect decolonization system that was sidelined in 1980. SRK has nothing that attaches him to ZANU-PF. He has not asked them to coronate him. He has not inveigled them like what others are doing. Unlike Bulelani and Zwide, RSK stands distinctly clear on ZANU-PF’s evil strategies of totally dismantling the RESTORATION AGENDA. As MLF, believing in the TOTAL RESTORATION AGENDA, are thus guided to embrace, believe and respect Mzilikazi ll as what he stands for epitomizes the nexus of the MTHWAKAZI livelihood and its existence. It is a model that does not usher MTHWAKAZI into total extinction vis-à-vis the model that seeks to coax ZANU-PF and subsequently liquidating into Shonalism. ABATHENGISI KABAKHATHALI. We will never take part in anything that seeks to perpetuate the existence of Zanuism. AMEN!!! MLF stands for Economic, Cultural, Social, Political emancipation and total RESTOTARION of MTHWAKAZI.